The 777-300ER is the extended version of the 777-300 but it contains many changes which includes GE90-115B engines that is said to be the world's most powerful jet engine having a 115,300 lbf (513 kN) thrust. Other changes include raked wingtips, a new main landing gear, extra fuel tanks a stronger fuselage and wings. 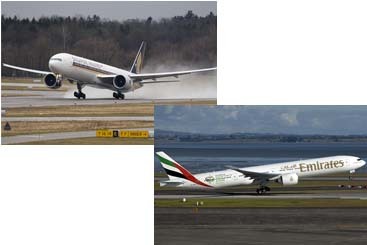 The 777-300ER's extra 1,935 nautical miles (3,550 km) range over the 777-300 is mainly due to the increase in the maximum takeoff weight (MTOW), along with the increased capacity for 2,600 gallons of additional fuel (45,220 to 47,890 US gal or 171,000 to 181,000 L). It can fly an estimate of 34% farther than the 777-300.